Death and life are in the power of the tongue…What a chilling thought. When I stop and think about all the nonsense that I have spoken through the years and still speak to some extent, I cringe. How many people have I hurt with an errant and untamed tongue? How many hurts could I have healed with a loving and non-judgmental tongue? How many spiritual doors did I open or close in error because I chose to speak that which was contrary to the Word of God? The tongue! What a wondrous little organ. With it we are able to speak blessings and curses all within the same breath. With the tongue we praise God for His goodness; with the tongue we damn a person to hell. 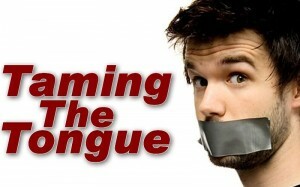 With the tongue we have the power to build up and the power to tear down. Through subtleness, the devil has programmed our minds to accept certain patterns of speech as common place. Often we speak words or phrases without thinking about the implications of what we just said. Instead of words that promote health, we often speak sickness. Instead of words of life, we often speak death. Habitually we belittle our loved ones instead of lifting them up. The following are some common expressions. See if any apply to you. In reading the accounts of Jesus from the Bible, it is clear that He was very careful with the words He spoke. His words had meaning and served a purpose. He understood the spiritual law behind the power of the spoken word. We would be wise to follow in His footsteps. The Word of God is life. Speak life over your circumstances. Death has enough friends.